When photographer Kjell Sæther threw a quick glance out the window before bedtime, he found himself captivated by a unique phenomenon. Whenever you look up at night and find the Karasjok sky illuminated, a reasonable expectation would be that it is due to either the aurora borealis (especially if you’re on a northern light safari) or the midnight sun, depending on season. Sunday night, that was not the case for photographer Kjell Sæther as he was glancing out his window one last time before bedtime. 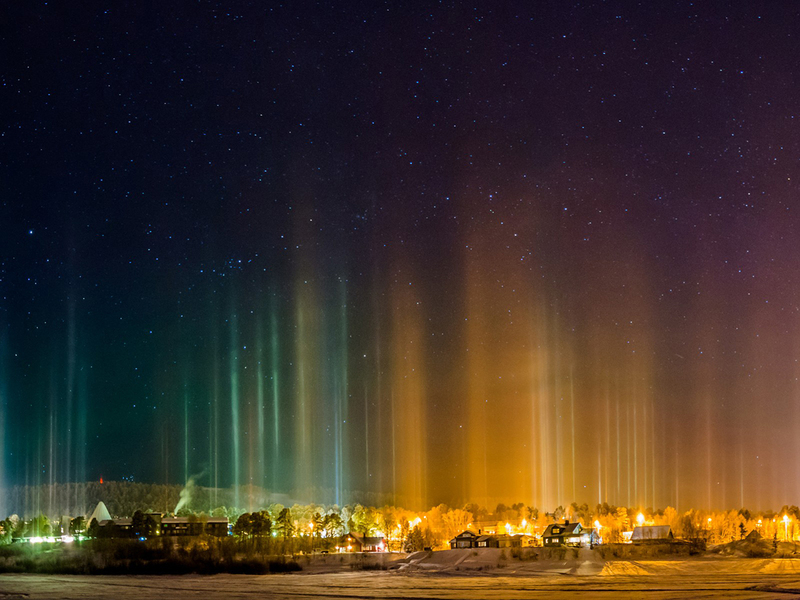 Sæther tells Norwegian newspaper Dagbladet that the temperature was down to minus 25 degrees Celsius and that the hour was about one in the morning when he found himself stunned by a light show that seemed out of this world – pillars of light in all colours rising from nearby houses and streets. The result of his quick trip out in the cold was a unique set of photos that looks great without requiring any manipulation. Sometimes, that’s just how beautiful the world actually is. The credit for this particular visual effect belongs to the weather. Meteorologist Jon Smits tells national broadcaster NRK Sápmi, who originally reported this story, that the lights are due to an optical illusion that will turn up in conditions of cold weather and minimal wind, with tiny ice particles floating through the air and forming vertical bands. Karasjok – dubbed the sami capital of the world – seems to have a lot of exciting stuff going on lately. According to newspaper iFinnmark, a live reindeer was checked into the local Scandic hotel last week.